Juvenile green turtle with tumors (credit: Chris Stankis, Flickr/Bluewavechris). 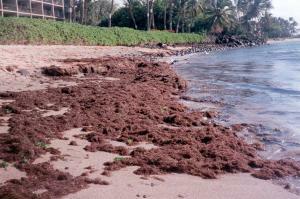 The algae Hypnea musciformis is a bloom species at several sites on Maui (credit: JE Smith). Hawai‘i’s sea turtles are afflicted with chronic and often lethal tumors caused by consuming non-native algae, "superweeds," along coastlines where nutrient pollution is unchecked. The disease that causes these tumors is considered the leading cause of death in endangered green sea turtles. The new research was just published in the scientific journal PeerJ. Turtles that graze on blooms of invasive seaweeds end up with a diet that is rich in a particular amino acid, arginine, which promotes the virus that creates the tumors. Scientists at the University of Hawai‘i at Mānoa and their NOAA colleague estimate that adult turtles foraging at high-nutrient grazing sites increase their arginine intake 17–26 g daily, up to 14 times the background level. 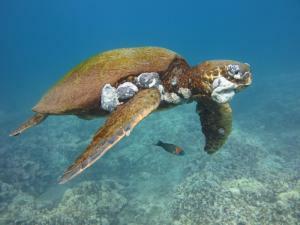 More than 60 percent of turtles in Kāne‘ohe Bay have been observed to bear tumors. 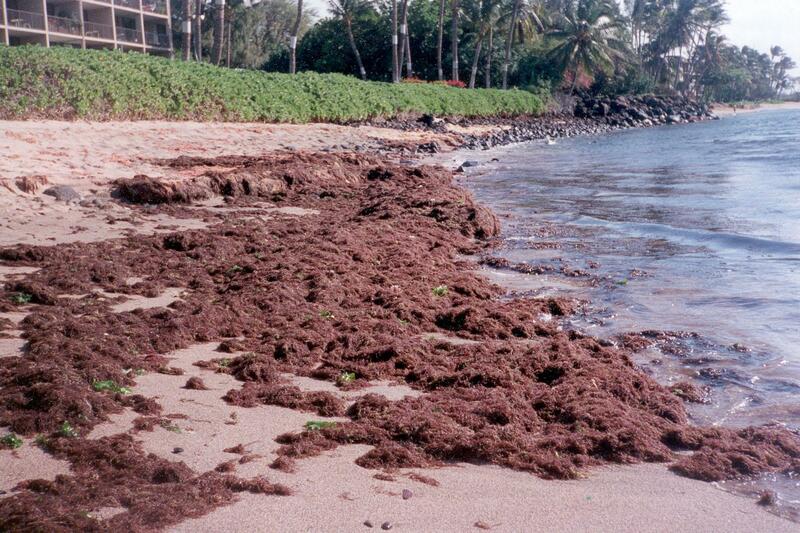 Kihei, Maui, has been called a "ground zero" for fibropapillomatosis, the disease that is caused by a herpes virus and manifests as tumors in turtles. Humans appear unaffected by the disease. Van Houtan and colleagues previously described an epidemiological link between tumors and coastal eutrophication, that is, the enrichment of coastal waters with nutrients from land-based sources of pollution such as wastewater or agricultural fertilizers. This new study analyzed the actual tissues from tumored green turtles and the amounts of arginine in the dominant algae forage species from across Hawai‘i. The analysis revealed remarkably high levels of arginine in tissues of invasive seaweeds harvested under nutrient-rich conditions, such as those affected by nitrogen from land-based pollution. These are the same conditions that promote algal blooms. The non-native algae "superweeds" grow so quickly when fertilized that some can double their weight in a period of two days. When found on typical healthy reefs with low nutrient inputs, the same invasive algae species had lower levels of amino acids, even though arginine levels were still elevated. A native algae species and favorite food of the green sea turtle called Pterocladiella capillacea did not synthesize anomalously high levels of arginine under low nitrogen conditions. “I’ve never had a research project where so many different tools have been used to evaluate a hypothesis and, in every case, the same complex answer is returned: excess nutrients in coastal waters drive blooms of specific invasive algae,” Smith said. “These weeds then grow rapidly, dominate shallow water ecosystems, and store high levels of arginine in their tissues that trigger tumor growth for the grazing turtle population. Few could have imagined that an algal bloom could have such consequences up the food chain." Smith and her colleagues, including UH Mānoa’s Meghan L. Dailer and Migiwa S. Kawachi, note that eutrophication of coastal waters goes beyond its influence on green turtle populations. Eutrophication is also associated with coral reef declines. The biggest losers might be the gentle sea turtles, who are not looking beyond their next algae snack. Photo 1: Juvenile green turtle (Chelonia mydas) severely afflicted with fibropapillomatosis, a tumor-forming disease associated with α-herpes viruses. Photo: August 2012 Makena, Maui (credit: Chris Stankis, Flickr/Bluewavechris). Photo 2: Species matter—The algae Hypnea musciformis is a bloom species at several sites on Maui, grows rapidly, and can store arginine at levels 2 to 3 times higher when growing at eutrophic sites than when the same species is growing at oligotrophic sites (credit: JE Smith). This research was supported in part by a grant from Disney’s Worldwide Conservation Fund and NOAA Fisheries, Marine Turtle Assessment Program.